Barley & Mushrooms are great companion foods. In a risotto type dish, stew, or soup, they have a restful flavour, reminiscent of a walk in the misty forest of late fall. 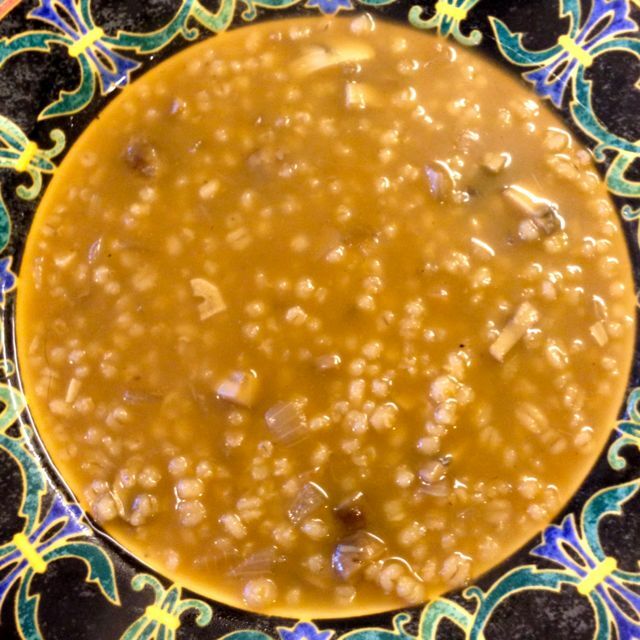 Scotch Broth and Oxtail soup are similar soups except that they require meat and several more ingredients. This is a very simple soup, usually the ingredients are on hand, and it takes about 45 minutes to make. If you have this recipe in your repertoire, you can pull a hearty, nutritious, vegetarian dinner out of a hat in under an hour. Just serve with some great bread, such as Hearth Bread. When boiling, add in the barley, stir well and simmer until tender, stirring occasionally. Add in the onion and garlic, cook, stirring as needed, until just starting to caramelize and translucent. Add in the mushrooms, cook, stirring occasionally, until golden and fragrant. Add in the parsley and cook for 3 more minutes. Add the cooked vegetables to the simmering barley; the barley doesn’t need to be finished cooking. Add in the salt, soya sauce, and sherry. Continue cooking until barley is tender and soup is starting to thicken from the barley. If soup is too thick, add in one cup of boiling water, or as needed. Ann, this is all so beautiful! Thank you for sharing your gifts and talents like this. I have been needing some new ideas for cooking. Yay! You are welcome, I am enjoying doing it, and there always seems to be someone or more to eat the offings!